The Tender stage of a project is the real meat of a project where all materials and construction, structure and services of all parts of the building are brought together for pricing by a number of contractors. While the lowest tender is not always the one chosen for a number of factors as it sometimes can be unrealistically low which can lead to financial and programming problems during construction. The Client’s role in this stage is to be mindful of their budgets and input to the design, bearing in mind that the project will go to Tender. See Construction Cost Guide and Project Specific Factors to consider. In smaller projects the Client sets aside a separate budget for Furnishings and Fittings which would remain outside the main contract typically where there is better value in dealing directly with the Suppliers. The Contractor will be requested to include in his programme their facilitation / installation on site as outlined in the Tender documents. PRELIMINARIES- Under which conditions the works are to be carried out. MEASURED WORKS -Bill of Quantity. Key Drivers in all Design / Construction projects are TIME / COST/SCOPE The Designs ( including drawings and specifications) and Schedule of Works define which specific materials are to be used, where and how they will meet specific performance criteria. The other accompanying documentation define the specific conditions under which the works are to be carried out and the quantities of each item to be used in the building or project. Engineers will work with the Architect to provide the most efficient ( and cost efficient ) design solutions for structure drainage and services .. Any conditions imposed from the Fire and Disabled Access Authorities in their Certificates will be incorporated into the Tender design and Specifications as Amendments. A lot of input is required during this phase from the Client, particularly on preferences for internal and external materials and sources/ cost ranges etc. with input from the Quantity Surveyor at this point advising on cost / choice options .Contingency Sums included in Tenders for unforeseen events vary from 5-10% depending on the nature of project but in existing older buildings closer to 10% is advisable. In smaller projects the Contractor’s Plumber and Electrican are requested to design the services from the architectural drawings which show locations and specification of heating / cooling, kitchen , bathroom etc layouts.In this instance they will be responsible for Certifying the completed installation. At least 3 Competent Contractors agree to tender and are checked out via referrals , Insurances and Revenue to ensure that they are capable of delivering the project.They in turn will have their Domestic Sub Contractors specialised in Joinery, Solar Panels etc. 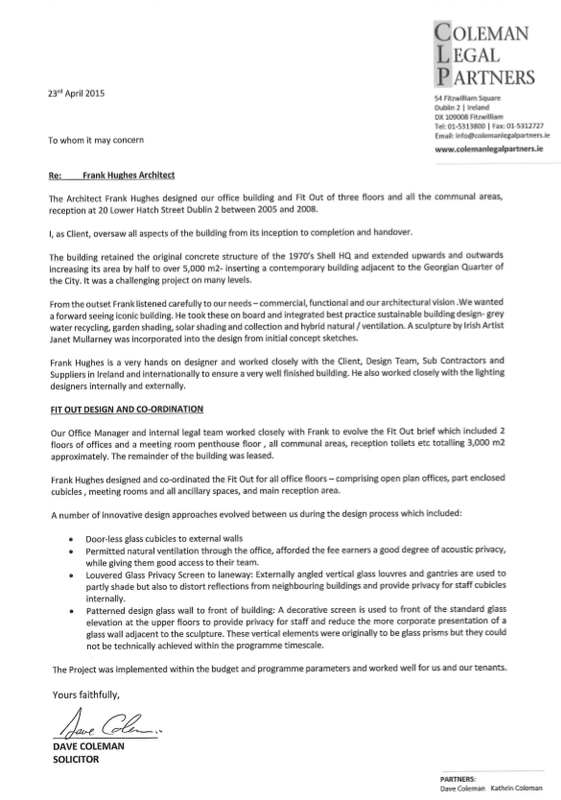 In certain cases and more complex projects , the Design Team might recommend the use of specialised sub contractors who are termed Nominated Subcontractors to carry out highly specialised Works including design for the Main Contractor such as Heating and Cooling- A separate Tendering process is undertaken to award this designation . The Tender documentation- drawings, specifications , Schedule of Works and itemised Bill of Quantities describe the scope of the works and under which conditions , type of Contract they are to be carried out. The Contractor will supply as part of his Tender submission a draft programme showing start date, end date and the sequencing of the different phases of works. Key dates will be identified for Client and Design Team decisions. It is advisable to include a Liquidated Damages Clause in the Contract Documents to make allowance for deductions for late delivery of project to enable the Client to reccupe out of pocket expenses. The Core Design Team provides the following information for the tender. Additional soil and underground CCTV surveys may be required . Agreement with Client on type of Client / Contractor Contract to be used. Detailed Plans, Sections , Elevations with details and specifications . Specification on materials and workmanship. Preliminary Health and Safety Plan. Issue of Form of Tender. Consultation with Public Utilities will be undertaken. 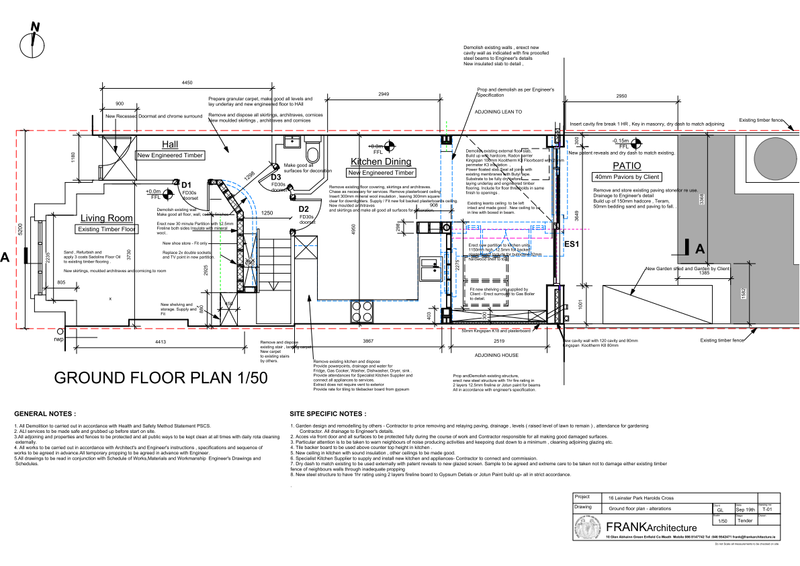 Plans and ceiling plans with all services. Specifications for the above . On completion of all the design drawings and specifications from the other consultants, the Quantity Surveyor will measure each and every element in the building and create The Bill of Quantities . This will be the basis for the tender and ensure that all contractors price on a ‘like for like basis’. It is also used to cost Variations or changes in the scope of the works during teh construction phase . Once the Tender is issued , a fixed period is allowed for receipt of completed tenders in 2 parts- (a.) The Form of tender , a one page summary of costs and (b.) The completed Bill of Quantities . A formal Tendering Procedure is observed to ensure fairness with the Completed Bills of Quantities of unsuccessful tenderers being returned unopened.